Enjoy a spellbinding holiday on Enchantment of the Seas! Sail to some of the world’s most spectacular destinations onboard Enchantment of the Seas, from the lively ports of the Bahamas to the sunny Caribbean. Relax on the exclusive island of Cococay, snorkel among shipwrecks in Bermuda’s pristine waters, or swim with dolphins off the Bahamas coastline. Whatever the destination, you’ll do it all in style with an Enchantment of the Seas tour. 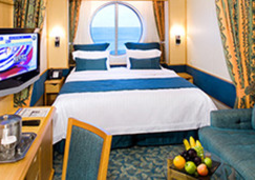 Royal Caribbean cruise holidays are unforgettable, wowing guests time and time again. Soak in one of the ship's nine pools and whirlpools, try your hand at rock climbing, fly above the ocean on a bungee trampoline, or pamper yourself with a day in the spa. 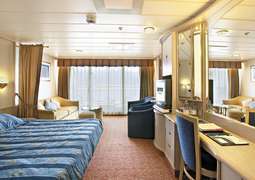 With a wide variety of activities, Enchantment of the Seas is a family-friendly cruise ship. However, for those moments when you need a bit of peace and quiet, the adults-only solarium beckons. 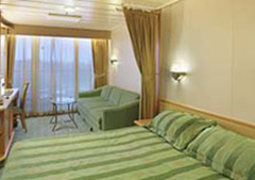 Fantastic food and spacious accommodations make this ship a favorite among cruise lovers. 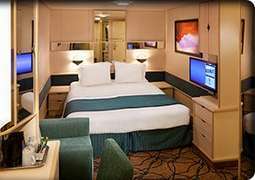 Twin Oceanview or Interior Staterooms come in various sizes, from 136 square feet and 145 square feet with twin beds and a private bathroom, to 151 square feet with a sitting area. All twin beds convert to a king double, and room service is available. Family and wheelchair-accessible rooms are available as well. All rooms have LED TVs, hairdryers, a minibar, and air conditioning. Enjoy a hearty steak dinner in Chops Grille, sample food from around the world in Windjammer, or dine in style in the main dining room. Wash it all down with drinks at the nautically themed Schooner Bar, or chill out in one of the ship’s chic cocktail bars or night spots. When it comes to breakfast, there are plenty of cafés on board offering a wide array of freshly made dishes. The ship boasts three pools, a beauty salon, solarium, and splash deck with an interactive play fountain, as well as a spa and fitness center, rock climbing wall, bungee trampoline, selection of boutiques, video arcade, and outdoor movie screen. Offering themed play areas for kids up to 36 months and an award-winning kid’s club, Adventure Ocean, Enchantment of the Seas is the perfect family cruise ship. The ship's dress code is smart casual. During the day, casual dress is the norm, but in the dining room, neither shorts nor flip-flops are permitted, and men’s shirts must be long sleeved. On formal nights, formal attire is required in the restaurants and bars. Suits, ties, and tuxedos are appropriate for men, while women may wear dresses.